Is it possible that a group of humans related to Australian Aborigines somehow made its way into South America before Native Americans crossed the Bering Strait and entered the New World over 13,000 years ago? In other words, were the First Americans actually the Second Americans? Believe it or not, that is the scenario that has emerged from several studies over the past three years … or at least, it’s one of a couple scenarios that have been suggested. Researchers have dubbed this mystery group “Population Y” after the word ypykuera, which means ancestor in a Brazilian language called Tupi. Until the mystery of Population Y emerged, genetic studies in concert with archaeological finds have tended to point toward the conclusion that all native people in the New World descend from a common origin – that is, from Siberians who crossed the Bering Straits over 15,000 years ago (ya). North and South America are, of course, the last two continents to be populated by homo sapiens. 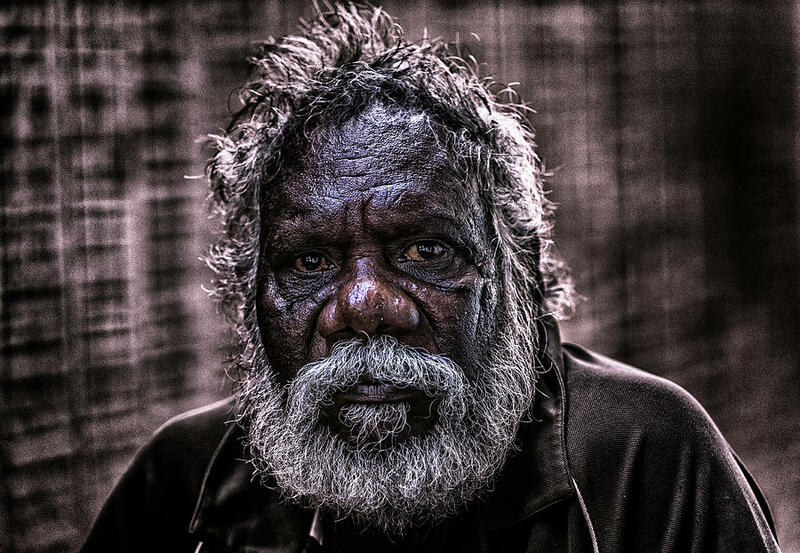 Australasians is the term used to describe Aborigines, Papua New Guineans, Andaman Islanders, Mamanwa Negritos, and other groups in the Philippines. The Andaman Islands were recently in the news because an American missionary, John Chau, was killed when he attempted to make illegal contact with natives on North Sentinel Island in November 2018. “We spent a lot of time being skeptical and incredulous about the finding and trying to make it go away, but it just got stronger.”1)Ewen Callaway, “Ghost population hints at long-lost migration to the Americas,” Nature: International Weekly Journal of Science, 21 July 2015. The 2015 studies were published in the journals Nature2)Skoglund, P. et al. Nature http://dx.doi.org/10.1038/nature14895 (2015). and Science3)Raghavan, M. et al. Science http://dx.doi.org/10.1126/science.aab3884 (2015). At the time of the discovery in 2015, the DNA of very few ancient Native American remains had been tested. The genetic link was discovered only in current humans who agreed to be tested. 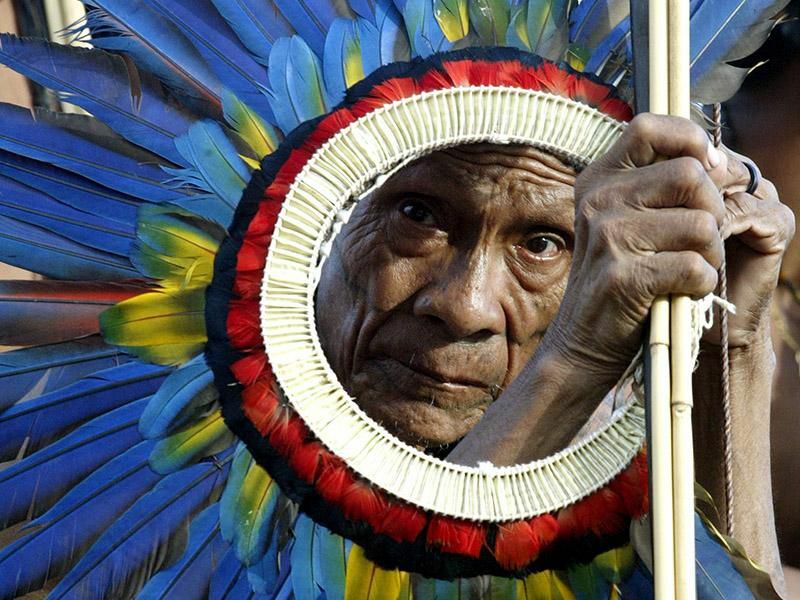 The connection is not linear – that is, the Brazilian tribes in question are not directly descended from Australian Aborigines, nor are Aborigines descended from them. Instead, today’s Australasians and some members of these three Brazilian tribes today are very distant cousins who are likely descended from a common population, and it is that hypothesized common population which has been dubbed Population Y. As Pontus Skoglund who worked with Professor Reich points out, Population Y is “an unknown group that doesn’t exist anymore.”4)Callaway, “Ghost population,” Nature, 21 July 2015. The theory is that Population Y would have existed somewhere in East Asia, time frame unclear, and then split – one group went south and one north, with the northern group eventually making its way across the Bering Strait and into the Americas. The two new studies represent the first major effort to systematically test and analyze multiple ancient human DNA samples from the Americas. The Harvard team decoded 49 ancient genomes going as far back as 12,800 ya while the Copenhagen/ Cambridge team decoded 15 ancient genomes going as far back as 10,600 ya. Previously less than 10 ancient genomes in the New World had been analyzed by anyone. A lot of interesting insights came out of the two studies, with the Australasian connection being only one small aspect of their overall findings. Disappointingly, none of the 49 ancient samples in the Cell study revealed an Australasian genetic signature. One sample from the Science study, however did: the 10,400-year-old Lagoa Santa remains in Brazil. That would appear to be evidence that descendants of the “ghost” population known as Population Y were in South America at least 10,000 ya. 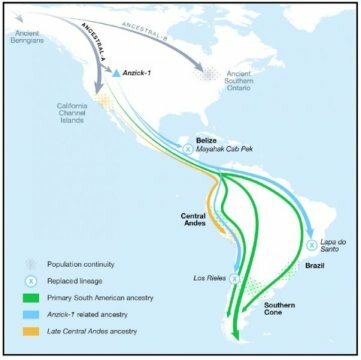 If we assume that the migratory route that brought this Australasian ancestry to South America went through North America, either the carriers … came in as a structured population and went straight to South America where they later mixed with new incoming groups, or they entered later. At the moment, we cannot resolve which …7)St John’s College, University of Cambridge, “DNA of world’s oldest natural mummy unlocks secrets of Ice Age tribes in the Americas,” ScienceDaily, 8 November 2018 (www.sciencedaily.com/releases/2018/11/181108142340.htm). The emphasis now is on continuing to find and test more ancient remains. That will help verify the existence of Population Y and pin down the timing of its entrance into the New World. To me, imagining that Population Y came after Native Americans seems like quite a stretch. I don’t know how a separate population travels all the way from Asia through North America to the Amazon jungle without leaving some trace of their existence along the way. (Arriving in South America across the oceans 10 or 20 thousand years ago seems even more fantastic.) It makes much more sense that the Population Y group is more ancient than the Paleoamericans who arrived 15,000 ya. They could have easily been more widespread and were displaced. Interestingly, I have not seen any comment about Neanderthals, or especially Denisovans, in connection with the Population Y signal in Brazil. Since we know that Australasians have a higher proportion of Denisovan introgression than any other population, one would think that checking for Denisovan alleles in the Brazilian tribes would contribute to the discussion. Just a thought. 1. ↑ Ewen Callaway, “Ghost population hints at long-lost migration to the Americas,” Nature: International Weekly Journal of Science, 21 July 2015. 2. ↑ Skoglund, P. et al. Nature http://dx.doi.org/10.1038/nature14895 (2015). 4. ↑ Callaway, “Ghost population,” Nature, 21 July 2015. 7. ↑ St John’s College, University of Cambridge, “DNA of world’s oldest natural mummy unlocks secrets of Ice Age tribes in the Americas,” ScienceDaily, 8 November 2018 (www.sciencedaily.com/releases/2018/11/181108142340.htm).